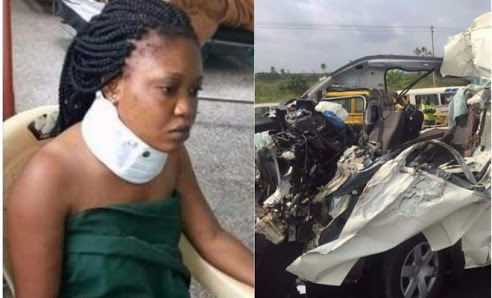 Here's one of the two victims who survived the fatal accident that claimed 8 lives at the Benin-Lagos express road two days ago. The accident killed eight indigenes of Edo state (five males and three females) who arrived from Spain for a traditional marriage after a Hummer bus conveying them rammed into a Mack truck. The driver of the speeding hummer bus rammed into the rear of a truck in an attempt to overtake it. Seven of the victims were reported to have died at the accident scene while one other died later. Their remains were deposited at the morgue of the Olabisi Onabanjo University Teaching Hospital, Sagamu, where two others rescued alive, were also receiving treatment.